I recently received the COAST TX10, a medium output multi-color LED flashlight. 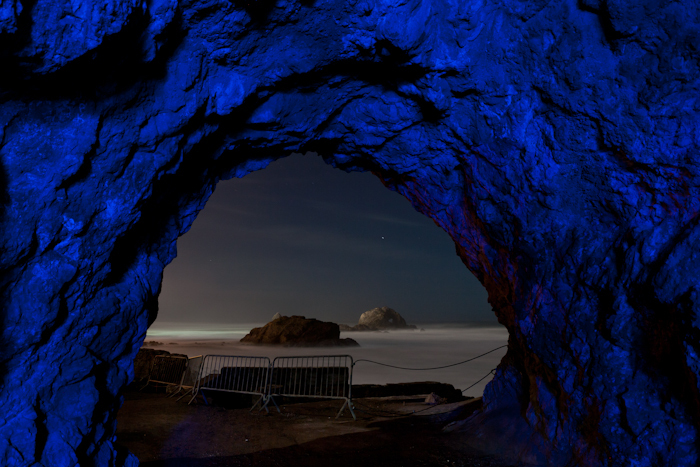 Overall, this is a great light, perfect for light painters since there are 4 colors available within a single light. It's also light weight and small enough to fit in a pant or jacket pocket while out taking photos. While holding the TX10 in my hand, it feels solid and smooth, but also very light. The body has a texturized surface, making the light less slippery and easier to hold. At the back of the flashlight there's a place to attach a small wrist strap (not included with the light). I attached a strap to try it out, but mostly used it to help dig the light out of a pocket or bag. The TX10 has 4 buttons that act as switches to turn each of the colors on and off. What I like about these switches is that you can turn one color on, or use all colors simultaneously. Unfortunately, when it's dark there's no way to distinguish between the buttons for the different colors; all the buttons are the same size and feel the same. (I wish there was a textured button for the white LED.) This definitely makes it more difficult to use a specific color of this light in the dark without mistakenly turning on and off a wrong color before finding the one you want to use. The flashlight runs on (3) AAA batteries and has a run time of about 5-6 hours in 40 degree weather. Battery life improves slightly in warmer temperatures. Capsule that holds the (3) AAA batteries. 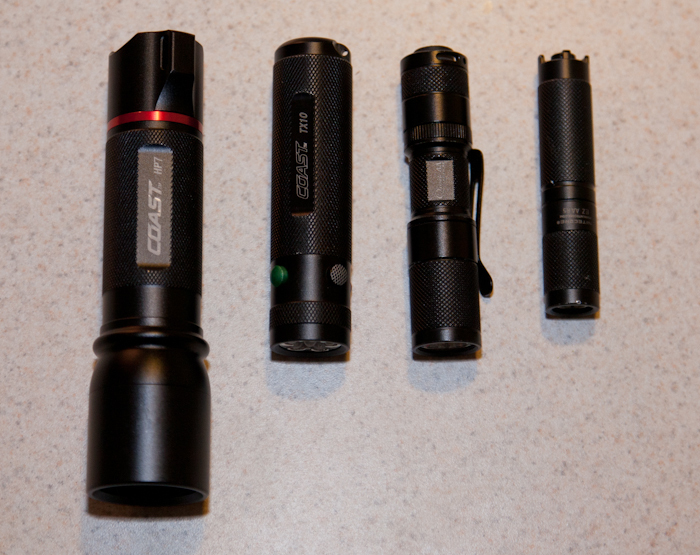 Left to right: Coast HP7, Coast TX10, Quark Single AA Tactical XP-G S2 and NiteCore EZ AA. 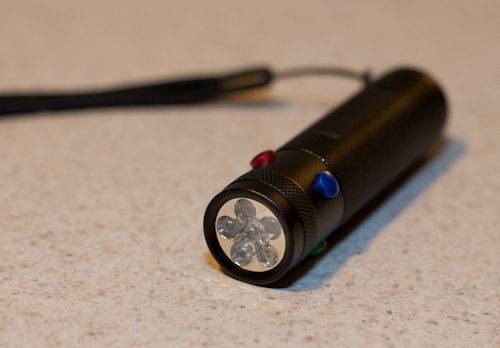 The front element of the flashlight contains 6 LED's and has 4 colors: white, red, green and blue. When using the white mode, 3 of the LEDs become lit (2 adjacent outer LEDs and the center LED). For each of the other colors (red, green and blue) only one LED is used. This makes the white light on the TX10 brighter than the other colors and gives the white a broader, smoother beam. You can also use more than one color at a time, for example, you can mix and match all the green and red to get orange or blue and red to get purple. The downside of this particular use is that because the colors have to come from different LEDs to blend, the colors do not blend very smoothly, unless the light is quickly painting a subject. The beam of the white LEDs is very smooth even at close distances. There's a slight hot spot in the center, but I find the hot spot helpful when navigating and using the light at night. For night photography, moving the light while painting seems to elimate the hot spot for the most part, especially when 5 or more feet from the subject. The blue LED has the narrowest and least smooth beam, while the green and red are very similar and more smooth. The white beam also seems to have a very blue/purple hot spot compared to my other lights. Left to right: Coast TX10, Quark Single AA Tactical XP-G S2 and NiteCore EZ AA. White LED beam focused on building from 20ft away. - Photography: Fairly bright, best used for close-to-camera and/or detailed light painting. Multi-colors are also good for navigating and searching for items inside a camera bag. - Night Navigation: Red LED is good for navigation at night (won't ruin your night vision) and isn't visible to the human eye over long distances. - Tactical: Multi-color LED uses: Red won't ruin your night vision. Green is often used in covert operations as it's harder to detect unless looking right at the beam. 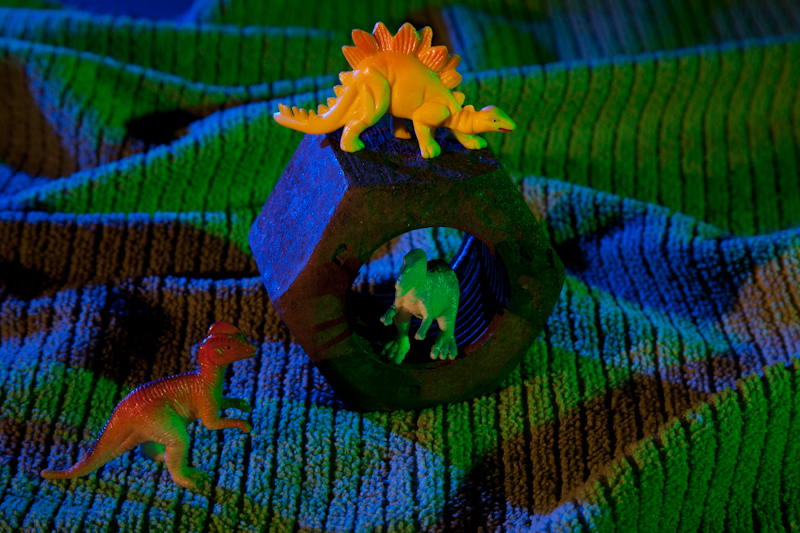 - Hunting: Multi-color LED uses: Many animals aren't alerted or spooked by a green LED. Red won't ruin your night vision. Blue works for detecting blood. Dark space. 30 seconds. f/11. ISO 100. Lit at 3 angles, with white, blue and green LED on TX10. Night. Full moon. 120 second exposure. f/9. ISO 200. Left face of structure lit with red LED on TX10 flashlight for about 20 seconds from 15ft away.